EZ Rental has introduced Change Fees that will reduce last-minute disruptions to vehicle planning. Late Return Fee: In addition to charging additional rental days for a late return, we reserve the right to charge $25 per day (maximum of 5 days) to compensate us in part for the costs we incur in finding an alternative vehicle to satisfy our next booking for your vehicle. You can reduce the fee paid by calling us in advance to update the date and time of your return. How to get Roadside Assistance? Can I use a "key ring" credit card when I rent a car from EZ Rental? No, EZ Rental does not currently accept the small credit cards issued by credit card companies that fit on a key ring. You must notify us if you will be going out of the USA. The minimum car rental for international travel is 3 days. We offer unlimited mileage on all rentals. However, if you are leaving NY, NJ area we may require a 3 day minimum rental. The following tips, obtained from the American Automobile Association and the American Car Rental Association, are meant as guidelines and EZ Rental urges you to use your best judgment in any particular situation. Before leaving the rental depo, be sure you know the route to your destination. If you must ask directions, ask a police officer or find a well-lighted public place. Stay out of high crime areas even if it means going out of your way. If any of these situations occur, drive to the nearest well-lighted public place to notify the proper authorities and to request assistance. In most areas, dial 911 for the police. Do not stop for flashing white lights. Lights on emergency vehicles in the U.S. are red and blue. If you are threatened with a gun or knife, give up your car immediately and report the incident to police and the rental car company. Keep doors and windows locked and keep your valuables locked in the trunk or glove compartment. Do not carry large amounts of cash. Do not pick up hitchhikers. Always park in well-lighted areas. If stopping to buy gas, use a pay phone or use an automatic teller machine (ATM), choose well-lighted, busy locations. If possible, avoid using an ATM at night. When walking toward a parked car, be aware of your surroundings and check the interior of the vehicle before unlocking doors. Have your keys in hand and ready when approaching your vehicle. Don’t be your own worst enemy… buckle up! Can I rent without a credit/ card? Sorry, but in order to rent from EZ Rental you must have a valid credit card in your name.  Does EZ Rental accept debit cards for payment? Yes, the payment method may be switched upon return of vehicle. But keep in mind if you are relying on your credit card insurance and something happened to the vehicle, they require you use your credit card as payment. Otherwise, they may not cover you and you will be responsible for the damages. Does EZ Rental offer one-way rentals? By contract, the renter is responsible for the payment of all tolls and violations, plus administrative costs involved. Some areas use video radar surveillance, allowing for moving violations to be captured by camera. The owner is identified by the license plate and notified by mail and billed for the infraction. As per the terms of the rental contract, these charges, plus an administrative fee per event, is billed to the credit card on file.